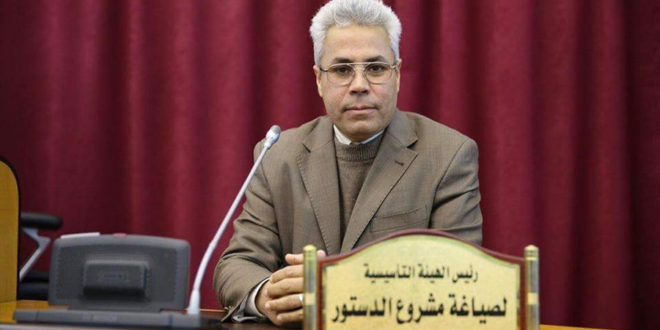 The Chairman of the Libyan Constitution Drafting Assembly (CDA) Noah Abdelsayid resigned Sunday, citing personal issues. Abdelsayed sent a letter to the CDA members telling them he won't resume work and would be waiting for them to approve the resignation, adding that he did an honest job without being allied to any group or political party. Sources said the man was pressured massively by the anti-current-constitution-draft parties, most effectively Khalifa Haftar's general command in Rajma, where reportedly Abdelsayid spent five hours on Sunday before the resignation came out, according to CDA member Itimad Elmessalati who spoke to Alnabaa TV Channel. Other CDA members told reporters that the resignation resulted from pressure put on Abdelsayid to hurdle Monday's House of Representatives' vote on the constitution referendum law. "His resignation doesn't affect the constitution draft approved on July 2017 as the deputy chairman can assume office as an acting chairman." CDA members explained. Recently, Abdelsayid urged the HoR to issue a constitution referendum law so Libyans can say yes or no to the CDA-devised draft. He also criticized the Geneva-based Center for Humanitarian Dialogue over its wish to meet with CDA constitution draft's boycotting members to reach consensus on the draft. The HoR will convene a meeting Monday to vote for passing a constitution referendum law amid failure expectations as those opposing the draft nearly control the decision-making within the HoR.